Last night I was craving something extra chocolatey and threw this batter together in a hurry not knowing if they would even turn out. Boy was I suprised to get such great results. I was so pleased with them, that I decided to bring a few to my church’s praise team practice. I always get a little nervous testing recipes on non-gluten free people, but figure that they are the best to judge, as they tend to be honest when something doesn’t taste “right”. These went over so well with them that I had to share my recipe on here today! 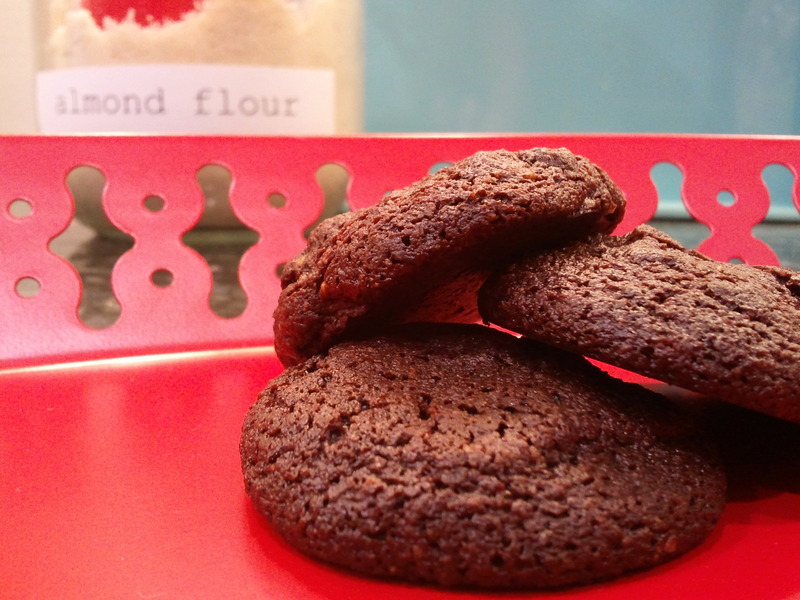 Plus it doesn’t hurt to add another gluten free cookie recipe for your holiday baking. Happy baking friends!! Whisk together flours, cocoa powder, baking soda and salt to remove all clumps. Stir in honey and butter. Preheat oven to 325 and let the batter rest and thicken, about 10 minutes. Scoop and bake for 10 minutes. Let cookies cool down on cookie sheet for a few minutes, then remove to cooling rack. OMGosh!! The batter is to DIE for!! I’m using Hazelnuts❤ I’ve been making lots of your recipes and they are all amazing, thank you so much for all you do❤❤ I can’t believe how lucky I am to find someone who is gluten free and also in love with dessert! Your the best!! These were so yummy! Thanks for your awesome recipes. Curious how you got yours to look puffy. Mine spread out and melded into each other while baking. Same thing happened with the snicker doodles (which were also very yummy, by the way). Thoughts? If your cookies are spreading, make sure you pack the flours (almond and coconut) when you measure. You can also refridgerate the dough. Personally, for both of these recipes you mention I also take out TBSP of butter and honey from each recipe. I made these and oh my gosh they are so good. Thank you for sharing this recipe. You have a great recipe. Can anyone tell me how many cookies they’ve made from this batter? I’m deciding whether or not to double the recipe for the holidays.